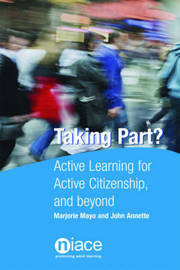 This book explores the contemporary approaches to democratic citizenship and community based education. It provides a series of case studies and reflects on the lessons of national initiatives. The case studies include examples of active learning for active citizenship with refugees, asylum seekers and migrant workers as well as with anti-racist activists among more established communities. There are also case studies of programmes working with a range of women, people with disabilities and their carers, and with faith based organisations. The book goes on to look at these approaches in a wider context, looking at the potential for developing global dimensions to citizenship, in an increasingly globalised world. Marjorie Mayo is professor in Community Development at the Centre for Lifelong Learning and Community Engagement, Goldsmiths, University of London John Annette is and Pro Vice Master for Lifelong Learning and Engagement at Birkbeck, University of London where he is also a Professor of Citizenship and Lifelong Learning.